Discussion on defining district borders for Tokyo is in progress. If you know the city pretty well, please share your opinion on the talk page. 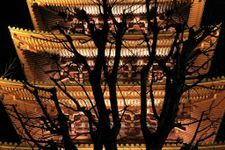 Tokyo is a huge city with several district articles containing sightseeing, restaurant, nightlife and accommodation listings — have a look at each of them. Huge and varied in its geography, with over 2,000km² (770 square miles) to explore, Tokyo Metropolis (東京都 Tōkyō-to) spans not just the city, but rugged mountains to the west and subtropical islands to the south. This article concentrates on the 23 central wards (区 ku) near the bay, while the western cities and the islands are covered in a separate article. The geography of central Tokyo is defined by the JR Yamanote Line (see Get around). 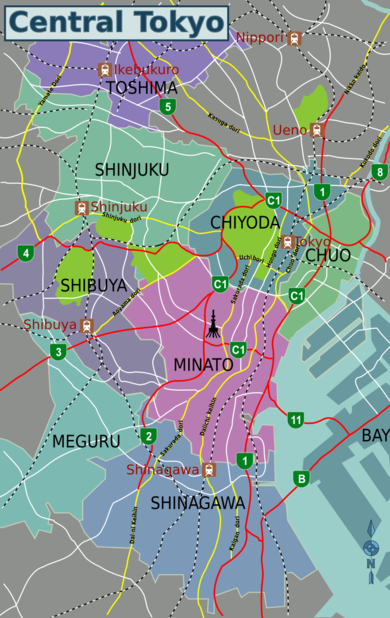 The center of Tokyo — the former area reserved for the Shogun and his samurai — lies within the loop, while the Edo-era downtown (下町 shitamachi) is to the north and east. Sprawling around in all directions and blending in seamlessly are Yokohama, Kawasaki and Chiba, Tokyo's suburbs. Including the business centers of Akasaka and Shinbashi, the famed neighboring nightclub district of Roppongi, the port district (at least in name) which includes the artificial island of Odaiba, the skyscrapers of Shiodome. The fashionable shopping district which also encompasses the teenybopper haven of Harajuku (also home to the Meiji Shrine) and the cosmopolitan nightlife of Ebisu. Home to luxury hotels, giant camera stores, futuristic skyscrapers, hundreds of shops and restaurants, and Kabukicho, Tokyo's traditional nightlife and red-light district. Home to Tokyo's last original tram line. Famous for Kameido Tenjin and former woodland in Kiba, but now known for its many new public apartment complexes. Home of the Edo-Tokyo Museum and Tokyo's main sumo arena (Ryogoku Kokugikan), both in Ryogoku. Tokyo is vast: it's best thought of not as a single city, but a constellation of cities that have grown together. Tokyo's districts vary wildly by character, from the electronic blare of Akihabara to the Imperial gardens and shrines of Chiyoda, from the hyperactive youth culture Mecca of Shibuya to the pottery shops and temple markets of Asakusa. If you don't like what you see, hop on the train and head to the next station, and you will find something entirely different. The cost of living in Tokyo is not as astronomical as it once was. Deflation and market pressures have helped to make costs in Tokyo comparable to most other large cities. Visitors from San Francisco, Los Angeles, New York, and London will likely not find it any more expensive than back home. Travellers should budget a similar amount of money for their stay in Tokyo as they would for any other great city in Europe, North America or Australia. Locals will know the bargains, but experienced cheapskates from anywhere in the world can get by with a little ingenuity. Tokyo is one of the most popular places to live in Japan. It is also rated the fifth most expensive city to live in, in the world. Rent for a single's apartment could range from USD500 to USD1,000 a month. Tokyo is so overwhelmingly crowded that apartments are usually no bigger than 175 square feet (16 square meters). Tokyo is classified as lying in the humid subtropical climate zone and has four distinct seasons. Summers are usually hot and humid with a temperature range of about 20-30°C (68-86°F), though it can sometimes climb into the high thirties. Winters are usually mild, with temperatures generally ranging from 0-10°C (32-50°F), though occasional cold spells can send temperatures plummeting below zero at night. Snow is rare, but on those rare occasions (once every few years) when Tokyo is hit by a snowstorm, much of the train network grinds to a halt. 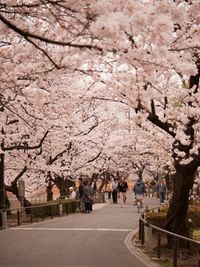 The famous cherry blossoms bloom in March-April and parks, most famously Ueno, fill up with blue tarps and sozzled salarymen. Send your bags into town before you arrive—Tokyo is crowded. Lugging even a moderately sized suitcase through the subways and up stairs can be difficult, particularly during rush hour. Delivery services (takkyuubin) deliver luggage dependably and quickly to nearly any address. You can send almost any shape or size of luggage, even bicycles, from and to the airport. One exception: if you have bottles of alcohol in your luggage, you'll have to carry those yourself even if the airline allowed them in your in checked baggage. At airports and major train stations, look for a sign that says "Baggage Delivery" or something similar. The most common company is called Kuroneko-Yamato, which has an easy-to-spot black-on-yellow logo of a mother cat carrying her kitten. Other companies include Nittsu and Sagawa. Japan Post, the national postal service, also offers luggage delivery called "Yu-Pack". Fees are based upon distance, expect to pay around ¥2000 within the greater Tokyo area. Usually, the delivery is performed the following day, in a specified time range. This works the same way on departure. Most hotels and many convenience stores will take care of the pick-up for you, but you should check delivery times in advance, so that your luggage can arrive in time for your flight. Most services require that you send your luggage to the airport two days prior to your departure. You can pick up your luggage in the airport lobby. This makes getting to the airport a breeze. This service can also be used for intercity travel. In Japan, all roads, rails, shipping lanes and planes lead to Tokyo. Tokyo has two large airports: Narita for international flights, and Haneda for (mostly) domestic flights. Haneda Airport (羽田空港 IATA: HND) officially known as Tokyo International Airport, in Ota is one of the busiest airports in all Asia despite a majority of flights being domestic. Domestic Terminal 1 houses the JAL group including Skymark and Skynet, while Domestic Terminal 2 is home to ANA and affiliate Air Do. In 2010, Haneda opened a brand new International Terminal Building along with a new runway. International flights operate into Haneda from 18 cities, with a number of these flights landing and departing during the late evening hours. Free shuttle buses run every six minutes between 05:00 and midnight, connecting the International terminal with both Domestic terminals. Monorail. The easiest and most scenic way from Haneda to the city is the Tokyo Monorail  running to Hamamatsucho for ¥470, from where you can connect to almost anywhere in Tokyo on the JR Yamanote line. The monorail has a station at each of Haneda's three terminals. From the International Terminal, trains reach Hamamatsucho in as little as 14 minutes on the nonstop services; the domestic terminals are about 5 minutes farther down the line. 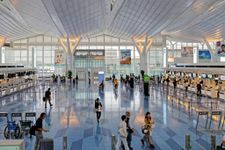 JR East maintains a Travel Service Center for foreigners in the International Terminal (06:45 to 18:30 daily) where vouchers can be exchanged for the Japan Rail Pass and JR East Rail Pass. The Tokyo Monorail is fully covered with either pass. The private Keikyu (京急) train line. There are two train stations at Haneda: one for the International Terminal and one serving both Domestic terminals. Keikyu trains run to Shinagawa (15 min, ¥407-410, Nov 2017) and Yokohama (30-35 min via Airport Express [エアポート急行], ¥448-450, Nov 2017). Some Keikyu trains from Haneda continue on to the Toei Asakusa Line, providing one-seat rides to Nihonbashi (30-35 min, ¥563-570, Nov 2017) and Asakusa (40-45 min, ¥614-620, Nov 2017). Airport Limousine bus service . The buses serve all 3 terminals at Haneda and many destinations. There are direct services to e.g. Tokyo station and to Shinjuku station. Tickets can be bought from a machine inside the terminal and cost e.g. ¥1230 for an adult daytime ticket to Shinjuku station. JR Passes are not valid on Keikyu Trains. If your final destination is somewhere along the Tokaido Shinkansen (i.e. Odawara, Atami, Shizuoka, Nagoya, Kyoto, Osaka) then it will be easier to take the Keikyu Line to Shinagawa to pick up the shinkansen, even if you have a Japan Rail Pass. Using the Tokyo Monorail will require you to take an additional train, the Yamanote Line, to either Tokyo station or Shinagawa. 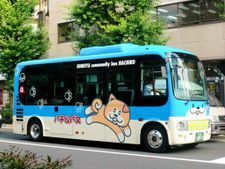 Limousine Buses do in fact connect Haneda Airport with Narita Airport (90 minutes, ¥3,000). Most Airport Rapid Express [エアポート快特] trains on the Keikyu Line also run all the way to Narita Airport's terminals; these services are much cheaper than the bus (90 minutes, ¥1,740), but buses operate more frequently. Note that the "Airport Terminal 2" station that pops up in some route search engines refers to terminal 2 at Narita Airport, not Haneda! Normal metered taxis to central Tokyo will cost anywhere from ¥4,000 to ¥10,000, plus a 20% surcharge between 22:00 and 05:00. An alternative is Anzen Taxi's  fixed fare service for ¥6,000 (¥8,000 at night) to most of central Tokyo, including Shinjuku and Shibuya. If you arrive on a late flight or need to catch an early flight, beware that there are no trains between midnight and 05:00 on either the monorail or the Keikyu line. Some limousine buses do operate after midnight, but such trips incur an additional "night surcharge". Chōfu Airfield (調布飛行場 Chōfu hikōjō) serves only some turboprop flights to the Izu Islands south of Tokyo. The nearest railway station is Nishi-Chōfu on the Keiō Line, a 15-minute walk away. Alternatively, you can take a bus from Chofu or Mitaka stations. Tokyo is the nerve centre of railways in Japan, highspeed Shinkansen services arrives at Tokyo Station (東京駅 Tōkyō-eki) which is located in the Chiyoda ward. For all trains on the northern route, you can get off at Ueno, while trains on the western route calls at Shinagawa. Most non-Shinkansen services usually stops at Shibuya and Shinjuku stations as well. Ueno and Ikebukuro stations connect you to the northern suburbs and neighboring prefectures. On the western route there are departures every 10-15 minutes from Nagoya, Kyoto and Osaka with two types of Shinkansen trains, Nozomi is the fastest which Stops only Shinagawa, Shin-Yokohama(located in Yokohama), Nagoya, Kyoto, Shin-Osaka(located in Osaka), cutting the journey time down to 2:20 hours while the slightly slower Hikari trains adds an extra twenty minutes. The northen route connects with Aomori, Fukushima and Sendai, the fastest services are with the Hayabusa and Hayate trains. Although Japan is dominated by fast Shinkansen trains there are still a few sleeper trains left. Sunrise Izumo (サンライズ出雲) runs daily to Tokyo from Izumo while Sunrise Seto (サンライズ瀬戸) connects with Takamatsu, the largest city on the Shikoku island. Also, the luxurious Cassiopeia (カシオペア) overnight train offers an direct route from the northen city of Sapporo three times a week. Fares starts at ¥27,000 with a journey time of 16½ hours. For those on a smaller budget, the Hokutosei (北斗星) leaves daily and has a more reasonable price of just over ¥9,000. Notice that the both trains from Sapporo arrives in Ueno. While you can drive into the city, it's really not recommended as the city can be congested, signs may be confusing and parking fees are astronomical. Hitchhiking into Tokyo is pretty easy, but hitchhiking out is considerably more difficult. It's definitely possible for determined cheapskates though, see Hitchhiking in Japan for a detailed list of tested escape routes from the city. Highway bus services link Tokyo to other cities, resort areas and the surrounding prefectures. There are JR and private bus companies. Bus service may be cheaper, but the train is probably more convenient. If you have a JR pass, then you should generally stick with the trains. Long-distance buses use a number of terminals scattered throughout the city, but the main JR depot is at Tokyo Station's Yaesu-minamiguchi (八重洲南口) exit, while Keio and some other private companies use the Shinjuku Highway Bus Terminal (新宿高速バスターミナル), opposite Yodobashi Camera near the West Exit. The JR Bus Group . A major operator of bus services to and from Tokyo. Seat reservations for JR Buses can be made at JR Bus counters in Tokyo and Shinjuku stations, and in JR train stations at the same "Midori-no-Madoguchi" ticket windows used to reserve seats on trains. The Japan Rail Pass is NO LONGER valid on all JR Highway Buses. Willer Express . A company that has nightly bus services to and from Tokyo. Its bus services link many cities in Japan. Online booking available in English. Kokusai Kogyo Bus (Japanese Website). Nishi Tokyo Bus (Japanese Website). Tohoku Kyuko Bus (Japanese Website). One of the great ports of the world, Tokyo also has domestic ferry services to other points in Japan. However, none of the regular international ferries to Japan call at Tokyo. Tokyo-Tomakomai (Hokkaido): Kawasaki Kinkai Kisen, 03-3528-0718. This ferry has no passenger facilities, so it can only be used if you have a car; fares for a car and driver start at ¥25,820. Tokyo-Tokushima-Kitakyushu: Ocean Tokyu Ferry, 03-5148-0109. Tokyo-Kitakyushu passenger fares are ¥14,000 for second class, ¥26,600 for first class. Ferries to the Izu and Ogasawara Islands leave from Takeshiba Terminal (竹芝客船ターミナル), adjacent to Takeshiba station on the Yurikamome line. Cruise liners tend to use the Harumi Terminal (晴海客船ターミナル), best accessible on bus 都05 (To-05) from Tokyo station Marunouchi South Exit or 東12(Tou-12) from Tokyo station Yaesu exit. International ferries and cargo ferries that also take passengers can leave from other terminals too, enquire with your shipping company. Subway lines with transfer stations labeled. Different route maps show different systems, not giving details for the other systems. Sometimes switching between systems involves exiting and entering the fare area, even changing buildings. Using a Suica or PASMO card is the most efficient way of handling fares and transfer discounts automatically. Avoid rush hours if possible; trains and platforms get overcrowded very easily and directions, while generally very good and extensive, can be unclear in some cases. Announcements and signs are usually bilingual in Japanese and English, though in some areas frequented by tourists, signs in Korean and Chinese can also be seen. The defining rail line in Tokyo is the JR Yamanote Line (山手線), prefixed as 'JY', which runs in a loop around central Tokyo; being inside the Yamanote loop is synonymous with being in the core of Tokyo. Almost all inter-regional JR lines and private lines start at a station on the Yamanote. JR's lines are color-coded, and the Yamanote is green. The JR Chuo (中央線, orange) and Sobu (総武線, yellow) lines run side-by-side, bisecting the Yamanote loop from Shinjuku on the west to Tokyo on the east. JR's other commuter lines, the Saikyo and Keihin-Tohoku, run off the rim of the Yamanote loop to the north and south. JR East has a good English information line, 050-2016-1603 or 03-3423-0111. Tokyo has an extensive subway network with frequent trains, and these are primarily useful for getting around within the Yamanote loop. The Tokyo Metro  runs nine lines: Ginza, Marunouchi, Hibiya, Tozai, Chiyoda, Yurakucho, Hanzomon, Namboku and Fukutoshin lines. Toei  operates the Asakusa, Mita, Shinjuku, and Oedo lines. While the JR Yamanote Line is not a subway line, due to its importance as a major transportation artery in downtown Tokyo, it is usually featured on subway maps. A number of private commuter lines radiate from the Yamanote loop out into the outlying wards and suburbs, and almost all connect directly to subway lines within the loop. The private lines are useful for day trips outside the city, and are slightly cheaper than JR. 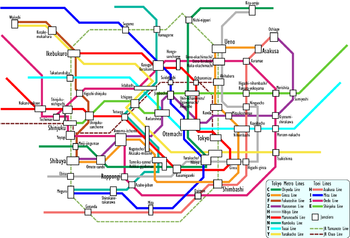 Note that the private lines are not shown in detail on the Tokyo Metro Subway map! The largely underground Rinkai Line is operated by Tokyo Waterfront Area Rapid Transit  (web-site only in Japanese) or TWR, that passes through the island of Odaiba. The above-ground, automated, rubber-wheeled and very scenic Yurikamome  runs from Shimbashi to Toyosu, crossing the Sumida River in a serpentine loop over the Rainbow Bridge offering great views on the way to the island of Odaiba. Changing from one line to another can involve lengthy walks including many stairs or elevators. Lifts are available, but allow for extra detours. Changing between rail systems (e.g. from Metro to private lines) might involve leaving the building and signage can be interrupted. Sometimes tickets have to be re-checked while transferring (looks like an exit barrier, but isn't), sometimes you have to leave he fare-controlled area and re-enter. To avoid pedestrian streams needlessly crossing, walking is sometimes switched to the right - check the markings on the floor and take your cue from the locals. The Tokyo Metro line prefixes come from the first letter of the line name, e.g. 'G08' for Shimbashi station on the Ginza line. If you are using a smartphone you can benefit from a free, official Tokyo Subway Navigation  application available in the app stores. It works offline and has multilanguage interface, including English. It is very useful for quick route searches, but its lookup seem to be time-optimized and not cost-optimized. Also it only covers the subway and doesn't cover, for example, Monorail, so it is no use for travel between Haneda airport and the city, or on the private train lines. (Furthermore, if it does not recognize a station name it does nothing, and may seem to be broken.) Google Maps, on the other hand, covers all areas of Tokyo. The Tokyo Metro map  is a bit confusing as it bears little relation to actual geography, making it harder to find stations on a map. It does give station numbers (for metro lines, not JR lines...) and omits all details on the private lines except transfer points. Unfortunately, the maps lack some basic geographical reference. For example, the Sumida river is not shown and the Yurikamome line really goes in a ring around Odaiba island making it almost quicker to walk between the stations of Odaiba-Kahinkoen and Aomi then go on the train itself. Also, sometimes stations are not as far apart as it may seem from the schematic lines. Especially during rush hour it might be more enjoyable to walk between stations then trying to squeeze in for a stop or two. Most tickets and passes are sold and re-charged from automated vending machines. Almost all vending machines now have an "English" mode. Keep in mind that JR trains are free with a Japan Rail Pass . Tip: when arriving at an airport, look for a tourist information in the arrivals hall where English-speaking staff can help you more easily with selecting the best ticket option for you. Prepaid fare cards are convenient and highly recommended because they allow you to ride trains without having to read the sometimes Japanese-only fare maps to determine your fare, bringing your overall travel times down to nearly what experienced locals can do. Each person needs their own card while riding, but cards are not tied to an identifiable individual. PASMO, offered by private (non-JR) lines. Functionally they are completely interchangeable and can be used on just about every subway, train and bus line in Tokyo (with the noted exception of JR's Shinkansen and limited express trains). The fare cards are rechargeable "smart cards": you simply tap your card on the touch pad next to the turnstile as you go in, and do the same when going through to exit. There is an initial ¥500 deposit that you must pay when purchasing a fare card, but up to ¥20,000 in value can be stored on each card. The Suica card can only be returned for refund in the Tokyo area, while PASMO cards can be returned anywhere. Staff at information counters will assist obvious foreigners if you have any trouble recharging the cards. The older Passnet cards are not accepted anymore. If you still own some of these, you can exchange them for a PASMO or Suica card. 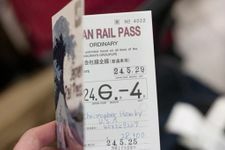 The Tokunai Pass (都区内パス) is a one-day pass good for travel on JR lines anywhere in the 23 wards of Tokyo (including the entire Yamanote Line and many stations surrounding it). It costs ¥730, making it economical if you plan to make five or more train hops in one day. A variant is the Tokunai Free Kippu (都区内フリーきっぷ), which also includes a round-trip into Tokyo from stations in the surrounding prefectures. The Monorail And Tokunai Free Kippu, which is good for two days and includes a round-trip from Haneda Airport to central Tokyo, is also sold for ¥2,000. The Holiday Pass (ホリデーパス) covers the entire JR network in the Tokyo metropolitan area, including Chiba, Kanagawa, Saitama and west Tokyo. It costs ¥2,300 for one day, and is only available on weekends, national holidays and during summer vacation (July 20 through August 31). The Tokyo Subway Ticket provides unlimited travel on consecutive days on all Tokyo Metro lines and Toei Subway lines, which serve most of central Tokyo. It is available as a 24-hour, 48-hour, or 72-hour ticket, which costs ¥800, ¥1200, and ¥1500 respectively. Passes are valid from the time of first use / activation until the same time the next day. It is only available to overseas visitors with foreign passports, and can only be purchased at specific places such as Narita, Haneda and Yonago airports, and BIC CAMERA and LAOX stores. It does not cover JR lines, including the Yamanote line. An Infographic is available. The Tokyo Metro 1-Day Open Ticket, which costs ¥600, covers Tokyo Metro network only (not the Toei Subway lines. Can be purchased in advance or from vending machines. Who is making announcements in English? In Tokyo, whichever train you take--namely, JR East, Tokyo Metro, Toei Subway, Tobu Railway, Seibu Railway, Odakyu Electric Railway, and Keisei Electric Railway--you will hear English announcements in a similar voice. Actually, they are all announced by the same voice actor, Christelle Ciari. In a Japanese interview she said, "Most railway companies I worked for did not give me any instruction on how to pronounce the station names in English. So I decided to read them in the original Japanese accent because I personally thought it was more natural and easier to comprehend for non-native speakers of English. The only exception was JR East, which instructed me to announce the station names in an American accent." Therefore, you will hear "Shibuya" on Tokyo Metro while you will hear "Sheebooyah" on JR trains. If you're paying a la carte, subway and train fares are based on distance, ranging from ¥110 to ¥310 for hops within central Tokyo. As a general rule of thumb, Tokyo Metro lines are cheapest, Toei lines are most expensive, and JR lines fall somewhere in the middle (but are usually cheaper than Metro for short trips, i.e. no more than 4 stations). Many of the private lines interoperate with the subways, which can occasionally make a single ride seem unreasonably expensive as you are in essence transferring to another line and fare system, even though you're still on the same train. E.g. changing between Metro subway line and Tokyu private line amounts to paying the sum of each fare: minimum fare Metro ¥160 + minimum fare Tokyu ¥120 = ¥280. In addition, several patterns of transfer are listed as "Transfer Discount", and the most famous one is ¥70 discount, that applies to a transfer between Tokyo Metro and Toei subway lines. When using paper tickets at some transfer stations, you may need to pass through a special transfer gate which is coloured orange - pass through the regular blue gate and you won't get your ticket back. At some transfer points (e.g. Asakusa station) you may actually need to transfer on street level as the two stations (Metro Ginza Line and Toei Asakusa Line) are not physically connected and are about one block apart. It pays to check your route beforehand. The Tokyo Transfer Guide  by the Tokyo Metro and Toei subway companies, is an online service that allows you to plan subway and train travel from point A to point B, based on time, cost, and transfers. This guide provides information for Tokyo only, and there are other sites which additionally cover the whole country, see the Japan page. Some major stations have terminals providing information similar to the Tokyo Transfer Guide. If you can't figure out how much it is to the destination, you can buy the cheapest ticket and pay the difference at the Fare Adjustment Machine (norikoshi) at the end. Most vending machines will let you buy a single ticket that covers a transfer between JR, subway and private lines, all the way to your destination, but working out how to do this may be a challenge if you are not familiar with the system. When transferring between systems using paper tickets, use the orange transfer gates to exit. Otherwise, you won't get your ticket back. Using Suica or PASMO cards handles all transfer discounts automatically for you. Most train lines in Tokyo run from around 05:00 to 01:00. During peak hours they run about once every three minutes; even during off-peak hours it's less than ten minutes between trains. The only night when regular passenger services run overnight is for the New Year's Holiday on select lines. Runs on other holidays and weekends actually stop slightly earlier (check the printed timetables stuck on walls on every platform). For additional information for train travel in Japan generally, refer to the By rail section in the Japan article. Stations have free public toilets (often inside the fare-controlled areas). Vending machines for drinks (coins, bills or Suica/PASMO smart cards). Mobile coverage and (satellite-) navigation are excellent, even underground. Taxis are very pricey, but may be a value for groups of three or more. Also, if you miss your last train, you may not have another choice. Fares generally start at ¥410 for the first two kilometers and can add up rapidly. A 20% night surcharge is tacked on from 22:00-05:00. As a rule of thumb, a daytime trip across the city from Tokyo station to Shinjuku station will cost approximately ¥3000, while a daytime trip from Tokyo station to Haneda Airport costs around ¥6200. These examples are based on standard routing and traffic conditions, so your actual fare may vary in relation to the estimated fare. Do not count on your taxi driver speaking English--or knowing more than the best-known locations, though most taxis have GPS "car navi" systems installed. The best and easiest thing to do is to prepare a map marked with where you want to go, and point it out on the map to the taxi driver. If you are staying at a hotel, they will provide a map. If possible, get a business card, or print out the address in Japanese of any specific places you wish to go. However, because in Japan streets are often unmarked, if the taxi driver does not have GPS he may not be able to do more than take you to the general vicinity of where you want to go. Also, note that taxis can get caught in traffic jams. Tips are entirely optional. Taxi rear left passenger doors are operated by the driver and open and close automatically. Don't open or close them yourself. Tokyo is a gigantic warren of narrow streets with no names, with sometimes slow-moving traffic and relatively limited and expensive parking. In this city with such an excellent mass transit system, you would need a good reason to want to drive around instead, unless you already have some familiarity with the city and its surroundings. While renting a car does make sense in Japan in some contexts (e.g. travelling between cities, visiting smaller towns or a rural onsen resort), in general it is neither convenient nor economical to rent a car to get around metro Tokyo. Taxis are much more convenient if your budget allows it; walking or public transportation is much less expensive and given the difficulties of navigation and finding parking in popular areas, probably easier too. If you do decide to plunge in and drive around by car, the main expressway serving Tokyo is the Shuto Expressway, abbreviated to Shutoko (首都高) . The C1 Loop Line forms a circle around central Tokyo, similar in fashion to how the Yamanote Line does it by rail. But whereas the Yamanote Line charges ¥130-250 for a single trip, driving a car onto the Shutoko in Tokyo entitles you to pay either in cash a flat entry fee of ¥900 every time you enter the system, or, if your car is equipped with the electronic toll system (ETC), a flexible toll between (¥500 and ¥900) depending on the distance travelled. When driving around, both on Shuto and on the regular streets, try to avoid the rush hour (with traffic moving into the centre in the morning, and out towards suburbs in the evening). Check with the car rental agency whether English-language navigation system is available, as it will make a huge difference, and you will be able to use your car to outperform the public transportation on many occasions. 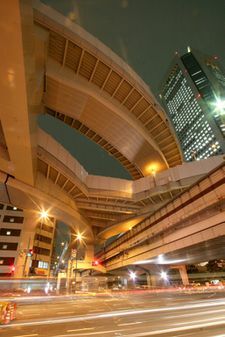 Driving on the Tokyo Expressway at night can be a pleasant and beautiful experience as you whiz through and around the Tokyo nightlife. When driving at night you should exercise caution and obey speed limits: Street racing over the Shutoko at night became popular in the 80's and 90's and still happens today, albeit on a less frequent basis. Street racers often concentrate their driving on the C1 Loop Line and the Bayshore (more popularly known as the Wangan) Line. "Competitors" sometimes hang out at parking and service areas on the Shutoko, especially the large Daikoku Parking Area at the intersection of the Bayshore Line and the K5 Daikoku Line in Yokohama. The few areas within Tokyo that aren't easily accessible by train are served by various bus companies. Buses operating within 23 wards of Tokyo have a fixed fare regardless of distance (¥200 on Toei buses  and ¥210 on other private bus companies), which is paid upon boarding from the front door. The fares are not transferable; however most buses do accept Suica or PASMO fare cards (see above). If you use a "Suica" or "PASMO" card to board a Toei Bus, you will receive a ¥100 discount on your next Toei Bus ride as long as it is within 90 minutes of the previous ride. The fare can also be payed in hard currency of practically any denomination, which can also be used to charge your electronic fare card if you tell the driver you wish to do so. Compared to the trains, the buses run much less frequently, carry fewer passengers, and are much slower. This makes them amenable to the elderly residents of Tokyo, but rather inconvenient for travelers, who will also have to deal with lack of information in English and sometimes very well hidden bus stops. The bus routes are named by a kanji based on a destination they serve and a number, e.g. "渋64" for the route between Shibuya (渋谷) and Nakano. The routes can be fairly complicated and are often not listed in detail at the bus stops; signs on the buses themselves often list only two or three main stops in addition to the origin and destination. Finding a bus going towards a main terminal like Shibuya or Shinjuku is therefore pretty easy, the other way around may be more difficult. You may find several different stops by different companies within a few meters, all sharing the same name; sometimes those are full-fledged waiting areas and sometimes only a signpost at a street corner. Inside the bus the next stop is usually announced several times, sometimes by a taped voice and sometimes by a mumbling driver; recently taped announcements in English are used on some lines, but are still rare. In addition the stop is displayed on an electronic display, but rarely in Latin writing. Some stops may have similar names, you should make sure you know the exact name of the stop you want to get off at. Drivers are usually very helpful, though aren't typically used to tourists and may be rather busy dealing with fares, passengers and traffic. Nevertheless, north-south routes are useful in the western side of the city since train lines (Odakyu, Keio, Chuo, and Seibu) tend to run east-west. Google Maps  has begun adding bus transit information and is possibly the easiest way of planning a trip by bus. 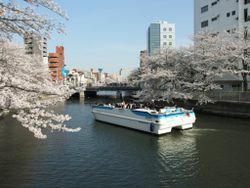 The Tokyo Cruise Ship Company operates a series of Water Bus  ferries along the Sumida River and in Tokyo Bay, connecting Asakusa, Hinode, Harumi and Odaiba. The ferries feature a recorded tour announced in English as well as Japanese and a trip on one makes for a relaxing, leisurely way to see the waterfront areas of Tokyo. Of particular note is the super-futuristic Himiko ferry  designed by anime and manga creator Leiji Matsumoto , which runs on the Asakusa-Odaiba Direct Line. You might want to arrive well before the departure time just in case tickets on the Himiko sell out! Bicycles are very commonly used for local transport, but amenities like bicycle lanes are rare, drivers pay little heed to bikes and traffic can be very heavy on weekdays, so if you use a bicycle, do not be afraid to cycle on the sidewalk (everyone does). Keep in mind, however, that parts of Tokyo are surprisingly hilly, and it's a sweaty job pedaling around in the summer heat. Central Tokyo can still be covered fairly comfortably by bike on the weekends. Tokyo Great Cycling Tour  offers a one day guided tour for biking around major tourist spots in Tokyo, like Marunouchi, Nihonbashi, Tsukiji, Odaiba, Tokyo tower, Imperial palace and so on. Renting a bike is possible from some youth hostels, particularly around Asakusa, although it's not common. However, buying a simple single-speed roadster is fairly cheap, and comes complete with a built-in bicycle wheel lock system (this is what most Tokyoites use). An imported multiple-geared bike will be much more expensive so get a good lock, as bike theft is a common threat, although the problem is nowhere near as serious as in other countries. In this large city with such an efficient public transportation system, walking to get from point A to point B would seem a bit stupid at first glance. However, as the city is extremely safe even at night, walking in Tokyo can be a very pleasant experience. In some areas, walking can be much shorter than taking the subway and walking the transit (the whole Akasaka/Nagatacho/Roppongi area in the center is for instance very easily covered on foot). If you have the time, Shinjuku to Shibuya via Omotesando takes roughly one hour, Tokyo Station to Shinjuku would be a half a day walk, and the whole Yamanote line Grand Tour takes a long day. It's possible for English speakers to navigate their way around Tokyo without speaking any Japanese. 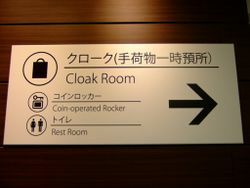 Signs at subway and train stations include the station names in romaji (Romanized characters), and larger stations often have signs in Chinese and Korean as well. Though most people under the age of 40 have learned English in school, proficiency is generally poor, and most locals would not know more than a few basic words and phrases. 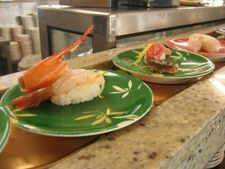 Some restaurants may have English menus (ask for an "Eigo (ey-go) menu" before you sit down), but it does not necessarily mean that the staff will speak much English. You can ask for "osusume (oh-sue-sue-meh)" if you'd simply like to eat a recommended menu item. Reading and writing is much better though, and many people can understand a great deal of written English without actually knowing how to speak it. That being said, staff at the main hotels and tourist attractions generally speak an acceptable level of English. While it is possible to get by with only English, it will nevertheless make your trip much smoother if you can learn some basic Japanese. It should also be noted that the Japanese are much more willing to speak English if you make some attempt to speak Japanese. At the very least learn to say common greetings and "which train to...". Overpronouncing the Y in names like Tokyo make it difficult for the native Japanese speaker to understand. It's not silent, but it's not a separate syllable either. "Toh-qyo"
Tokyo has a vast array of sights, but the first items on the agenda of most visitors are the temples of Asakusa, the gardens of the Imperial Palace (in Chiyoda) and the Meiji Shrine (明治神宮, in Harajuku). If you're looking for a viewing platform, the Tokyo Tower is the best known and offers an impressive view, even if it's rather overpriced at ¥1600. The highest spot in Tokyo is the Tokyo Metropolitan Government building (in effect, Tokyo's City Hall) in Shinjuku. Its twin towers have viewing platforms that are absolutely free, and offer a great view over Tokyo and beyond. However, the best option would probably be from the World Trade Center Building (10:00-20:00, or 21:00 in July and August, ¥620) at JR Hamamatsucho station which, although not as high, offers stunning views of Tokyo Tower and the waterfront due to its excellent location, especially at dusk. A recent addition to the viewing platforms around Tokyo is Tokyo City View in Roppongi Hills, Roppongi -- admission is a steep ¥1800, but includes admission to the Mori Art Museum. Another good option, if you don't mind traffic noise and smell, is the Rainbow Bridge at Odaiba, whose pedestrian walkways are free. The night-time view across Tokyo Bay is impressive but the walkways close at 20:00. Also, on a clear day, the Bunkyo Civic Center (next to the Tokyo Dome) offers an iconic view of Shinjuku against Mt. Fuji (especially great at sunset), also free. The city is dotted with museums, large and small, which center on every possible interest from pens to antique clocks to traditional and modern arts. Many of the largest museums are clustered around Ueno. At ¥500 to ¥1,000 or more, entrance fees can add up quickly. Riding Sky Bus Tokyo, an open-top double-decker operated by Hinomaru Limousine (every hour between 10:00 and 18:00), is a good option to take a quick tour around the city center. The 45 minutes bus ride on the "T-01 course" will take you around the Imperial Palace via Ginza and Marunouchi district, showing the highlight of Tokyo's shopping and business center. The fare is ¥1,500 for adults of 12 years old and over, and ¥700 for children between 4 and 11 years old. You can borrow a multi-language voice guide system free of charge upon purchasing a ticket, subject to stock availability. Four other bus courses are offered, including a night trip to Odaiba, but those trips are conducted in Japanese with no foreign language guidance. A beautiful weekend afternoon is best spent in Yoyogi Park, where young people from all walks of life gather to socialize, practice their hobbies (devoid of any fear of public humiliation), join a drum circle, play sports, etc. Afterwards, take a stroll down the trendy Omote-sandō (表参道) shopping street nearby. Check out the hip and young crowd at Harajuku's Takeshita-Dori (Takeshita Street) or the more grown up Omotesando. Enjoy a soak in a local "sento" or public bath. Or one of the big "super sento" onsen such as LaQua at the Tokyo Dome (Bunkyo) or Oedo Onsen Monogatari in Odaiba. Explore nightlife with a boisterous crowd of thirsty locals and expats on the Tokyo Pub Crawl. In the spring, take a boatride in Kichijoji's lovely Inokashira Park, and afterwards visit the Ghibli Studios Museum (well-known for their amazing movies, like Spirited Away, and Princess Mononoke), but you will need to buy tickets for these in advance at a Lawson convenience store. Lose yourself in the dazzling neon jungle outside major train stations in the evenings. Shibuya and east Shinjuku at night can make Times Square or Piccadilly Circus look rural in comparison — it has to be seen to be believed. Party in the Park with local Tokyoites and expats in the park. There is a weekly party at Ueno Park / Yoyogi Park where 90's and 00's hip-hop music is played. From ¥500 to join the party. Watch a baseball game; the Yomiuri Giants at the Tokyo Dome, or the Tokyo Yakult Swallows at Jingu Stadium. Nearby Chiba hosts the Chiba Lotte Marines, Saitama has the Seibu Lions, and Yokohama has the DeNA BayStars. Drive a kart around the city. Several vendors offer guided street legal go-kart tours of the city for tourists. Costumes are usually included and you will be very popular among Tokyo crowds when you drive through. Note that this does require an international driving permit and while Mario Kart themed, racing and throwing banana peels is not allowed. It's every bit as awesome as it sounds. SUMO The Sumo tourney is in mid September for 2018. If you can't get tickets, there are same day unreserved seats for sale at the Sumo hall. These seats are located on the upper level, last row in the back up against the wall. You can still see fairly well. The seats on the entrance side, where you bought your ticket face the line judge and are on the same side as the TV cameras. These seats go fast. To get one, bring something to mark your seat as taken: a book , a backpack or a sweater; move with speed after you buy your ticket and get to the Sumo hall early. This contributor arrived at 6:40 AM and found 54 people in line and still got a good seat. There is a McDonald's visible from the line and a Family Mart or two at the Joban station next to the hall. The line side is on the opposite side of the hall from the Edo Museum. You may have someone save your place, but! after 7:30 AM a man with a loudspeaker shows up and begins handing out numbered passes. You must be in line to get this pass and you must have this pass to buy your ticket. Ticket sales start at 8 AM. You are free to go after you mark your seat but you can only leave the hall and return once. Ok, you've done it, you have staked out your seat. Don't forget where it is. The tournament starts with the very lowest ranked Sumo wrestlers, the good guys show up in the late afternoon. What to do? 1. Walk around and pick out some seats you might like to reserve next time you visit Tokyo and write the seat numbers down. 2. Watch some of the junior wrestlers. 3. On the ground floor there are kiosks that sell a small booklet that explains Sumo in both English and Japanese for about 100 yen, buy a few. 4. Check out the food service and where the water fountains are. As the day goes on the food lines get longer and longer, you are not supposed to bring food in however. 5. Visit the Sumo museum inside the hall 6. On the outside balcony on the exit gate side in the afternoon you will get a birds eye view of Sumo fans welcoming their favorite wrestlers. If you leave you will get the back of your hand stamped with invisible UV ink. It washes off, be careful at lunch. If you go outside visit the EDO museum. During the tournament it is open every day, even Mondays when it is normally closed. As you might imagine a ton of people pour out of the hall when the event is over and the ticket machine lines at the stations are very long. Consider buying your return ticket on arrival though this may cost you a place or two in line. Outside of the hall you are not supposed to disturb the Sumo wrestlers, don't ask them to pose for pictures etc. Good luck! 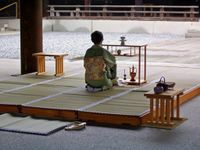 The curious can study traditional culture such as tea ceremony, calligraphy, or martial arts such as Karate, Judo, Aikido and Kendo. There are also many language schools to help you work on your Japanese. Several universities in Tokyo cater to international students at the undergraduate or graduate level. Kokugakuin University (國學院大學　Kokugakuin Daigaku), . A Shinto affiliated university. The university's research accomplishments in the areas of archaeology of are on display in one of Japan's largest university libraries on the main campus in Shibuya. Sophia University (上智大学 Jōchi Daigaku), . A prestigious private, Jesuit university well-known for its foreign language curriculae and large foreign student population. Main campus in Yotsuya. 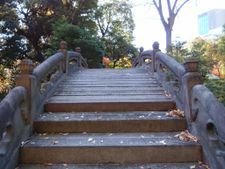 University of Tokyo (東京大学 Tōkyō Daigaku), . Japan's uncontested number one university, especially strong in law, medicine and literature. For locals, passing the entrance exams is fiendishly difficult, but exchange students can enter much more easily. Five campuses are scattered around the city, but the main campus is in Hongo. Teaching English (or to a lesser extent, other foreign languages) is still the easiest way to work in Tokyo, but the city also offers more work options than other areas of the country: everything from restaurant work to IT. Certain nationalities are eligible for working holiday visas: for others, work permits can be very hard to come by without a job offer from a Japanese company. Consult your local Japanese consulate/embassy as far in advance as possible. According to Ministry of Foreign Affairs of Japan, the working holiday programs in Japan are applied for citizens of Australia, New Zealand, Canada, the Republic of Korea, France, Germany, the United Kingdom, Ireland , Denmark, and Norway and for residents of Taiwan and Hong Kong. Japan and the country to be chosen as the partner of this program are to give permission to a person who has working holiday visa to spend holiday, and also to be engaged in the activity in order to receive the wages for compensating with a required travel fund. Cash payment is the norm. Most Japanese ATMs do not accept foreign cards, but post office, 7-Eleven and Citibank (now branded as Prestia by SMBC) ones do and usually have English menus as well (more recently, Mitsubishi-UFJ has opened its ATMs to UnionPay and Discover card users, while Mitsui-Sumitomo allows the use of UnionPay cards for a ¥75 surcharge regardless of time of day). *NOTE* As of June 2013, most Japanese bank ATM do not accept MasterCard, therefore you will not be able to withdraw cash from them. Citibank ATM may be an exception (unverified). However, purchase using MasterCard is accepted anywhere. Although credit cards are becoming more widely accepted, retailers are much less likely to allow their use than in most other developed countries. The crime rate is very low, so don't be afraid of carrying around wads of cash as the Japanese do. The average Japanese citizen will carry a month's worth of expenses on them (around ¥40,000 give or take). See Buy under Japan for general caveats regarding electronics and media compatibility. If it is for sale anywhere in the world, you can probably buy it in Tokyo. Tokyo is one of the fashion and cosmetic centers in the Eastern world. Items to look for include electronics, funky fashions, antique furniture, traditional clothing (kimono, yukata, jimbei, jika-tabi) as well as specialty items like Hello Kitty and Pokemon goods, anime and comics and their associated paraphernalia. Tokyo has some of the largest electronic industries in the world, such as Sony, Panasonic, and Toshiba etc. There are numerous convenience stores throughout Tokyo, which are open around the clock and sell not only food and magazines, but also daily necessities such as underwear and toiletries. Convenience stores are generally open round the clock. Department stores and shopping districts in general do not open before 10:00, many start at 11:00 or even 11:30 and close around 21:00. Shopping picks up from around midday to late. Tokyo enjoys a worldwide reputation as being one of the safest cities in the world, but as of recently reports of pickpocketing, perhaps due to the upcoming 2020 Summer Olympics, have been on the rise (especially in areas with high concentrations of tourists and shopping). Exercise usual discretion with valuables. Japan is a world leader in various intimate adult products, from stylish "Tenga" devices to various dolls with the replaceable body parts (and whole floors selling the spare "parts" for them), as well as some other bizarre goods. Akihabara hosts several large, multi-floor adult stores which are clearly marked as such. Prices for the Japan-made goods are generally better than in Europe and US, and the selection is better. If buying toys or lingerie make sure you purchase the "export" version to avoid size issues. Akihabara, Tokyo's Electric Town, is now also the unquestioned center of its otaku community, and the stores along Chuo-dori are packed to the rafters with anime (animation) and manga (comics). Another popular district for all things manga/anime is the Nakano ward and its Broadway Shopping arcade. Check out the mandarake shop for loads of used and rare mangas. In recent years there has been an "otaku boom" in Akihabara. A lot of attention in particular was paid to the town thanks to the popular Japanese drama "Densha Otoko", a love story about an otaku who saves a woman on a train and their subsequent courtship. Akihabara was previously known for its many live performances and cosplayers, some of which had drawn negative attention due to extremist performers. These have become increasingly scarce following the Akihabara massacre in 2008, although girls in various maid costumes can still be seen standing along the streets handing out advertisement fliers to passers by for Maid Cafes. Serious collectors should head for the Antique Mall in Ginza or the Antique Market in Omotesando, which despite the rustic names are collections of small very specialist shops (samurai armor, ukiyo-e prints, etc) with head-spinning prices. Mere mortals can venture over to Nishi-Ogikubo, where you can pick up scrolls of calligraphy and such for a few thousand yen. The Antique Festival (全国古民具骨董祭り)  is held over the weekend about 5-6 times a year at the Tokyo Ryutsu Center, on the Tokyo Monorail line, and is well worth a visit. Jinbocho is to used books what Akihabara is to electronics. It's clustered around the Jinbocho subway stop. The Blue Parrot is another shop located at Takadanobaba on the Yamanote line, just two stops north of Shinjuku. Ever since Sony and Nikon became synonymous with high-tech quality, Tokyo has been a favored place for buying electronics and cameras. Though the lines have blurred since the PC revolution, each has its traditional territory and stores: Akihabara has the electronics stores, including a large number of duty-free shops specializing in export models, and Shinjuku has the camera stores. Unfortunately, local model electronics are not cheap, but the pre-tax prices for the export models are similar to what you'll pay pre-tax in Europe, and are a little higher than U.S. prices. You can sometimes find cheap local models if you avoid big shops and check smaller retailers, and are willing to deal with Japanese-only interface, manual and service warranty. It's also surprisingly difficult to find certain things, eg games machines. Shibuya and neighboring Harajuku are the best-known shopping areas for funky, youthful clothes and accessories. Note that, almost without exception, clothes are sized for the petite Japanese frame. Department stores and exclusive boutiques stock every fashion label imaginable, but for global labels prices in Tokyo are typically higher than elsewhere in the world. The famous Ginza and Ikebukuro's giant Seibu and Tobu department stores (the largest in the world) are good hunting grounds. Recently, Roppongi Hills has emerged as a popular area for high-end shopping, with many major global brands. Other department stores in Tokyo are Mitsukoshi, Sogo, Marui (OIOI), and Takashimaya. Mitsukoshi is Japan's biggest department store chain. Its anchor store is in Nihonbashi. Marui Men store in Shinjuku has eight floors of high-end fashion for men only. 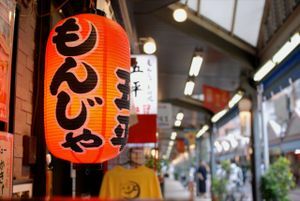 The district for this is Kappabashi Street near Asakusa, also known as “Kitchen Town.” The street is lined with stores selling all kinds of kitchen wares — this is where the restaurants of Tokyo get their supplies. It's also a great place to find cheap Japanese ceramics, not to mention plastic food! Ochanomizu is to the guitar what Jinbocho is to used books. There, you’ll find what must be the world’s densest collection of guitar shops. Plenty of other musical instruments (though not traditional Japanese ones) are also available. Women's shoes are easy to find in any shopping place. Men's shoes are a bit harder to come by, especially if you are looking for something more modern or higher quality. Bigger men's sizes above UK 10 / US 11 / Europe 44 may be difficult to come by. The up-market department stores will be your best bet. Trainers are available in all shapes, sizes and colours. For touristy Japanese knickknacks, the best places to shop are Nakamise in Asakusa and the Oriental Bazaar in Omotesando, which stock all the kitschy things like kanji-emblazoned T-shirts, foreigner-sized kimonos, ninja outfits for kids and ersatz samurai swords that can be surprisingly difficult to find elsewhere. Both also have a selection of serious antiques for the connoisseur, but see also Antiques above. Bustling open-air bazaars in the Asian style are rare in Tokyo, except for Ueno's Ameyoko, a legacy of the postwar occupation. Yanaka Ginza in the Shitamachi Taito district, a very nice example of a neighborhood shopping street, makes for an interesting afternoon browse. There are often small flea and antique markets in operation on the weekend at major (and minor) shrines in and around Tokyo. The sheer quantity, variety and quality of food in Tokyo will amaze you. Department stores have food halls, typically in the basement (called depachika), with food which surpasses top delicatessens in other world cities. Shopping malls and department stores have a restaurant section, usually on their upper floors. Some basements of train stations have supermarkets with free taste testers. It's a great way to sample some of the strange dishes they have for free. Tokyo has a large number of restaurants, so see the main Japan guide for the types of food you will encounter and some popular chains. Menus with pictures are often posted outside, so you can check the prices. Some shops have the famous plastic food in their front windows. Don't hesitate to drag the waiting staff out to the front to point at what you want. Always carry cash. Many restaurants will not accept credit cards. Tokyo has literally tens of thousands of restaurants representing more or less every cuisine in the world, but it also offers a few unique local specialties. Nigirizushi (fish pressed onto rice), known around the world around simply as "sushi," in fact originates from Tokyo. Another is monjayaki (もんじゃ焼き), a gooey, cabbage-filled version of okonomiyaki that uses a very thin batter to achieve a sticky, caramelized consistency. 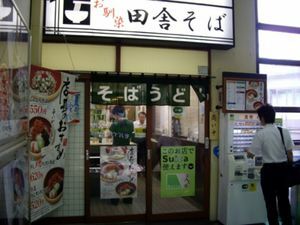 It is originally from the Tsukishima area of Chuo and today there are many restaurants near Asakusa offering monjayaki. While coffee shops open around 08:00 (sometimes earlier at busy stations), restaurants start from 11:00 and sometimes close at 15:00 or 16:00 till the evening. Having an early 11:00 o'clock-lunch is the easiest way of avoiding queues at popular places and will get you a seat, even if you come in alone. Hot Pepper Available in various editions, by region, around Tokyo, this free magazine offers a guide to local restaurants in Japanese but provides pictures and maps to the restaurants. Some restaurants even offer coupons. Most restaurants within this magazine are on the mid-range to high end scale. Tabelog is a local restaurant directory that has rating and reviews for restaurants in Japan. Available in English and Japanese. There are also numerous blogs on the internet devoted to food and eating in Tokyo written by international foodies. These websites can be a good source of reliable information for tourists. Some recommended blogs: Mehreen Amira''[];Andy Hayler []; Luxeat []; Miss.Neverfull [] ; The Pursuit of Food Perfection []; Food Sake Tokyo []; Kenneth Tiong eats []. Go to a convenience store (konbini), there is one on every second corner. Really, the options may surprise you. You can get rice balls (onigiri), bread-rolls, salads, prepared foods (like nikuman and oden), and drinks (both hot and cold) for ¥100-150, bento lunch boxes for around ¥500 and sandwiches for ¥250-350. At most convenience stores, microwaves are available to heat up your food for no additional cost. Supermarkets (suupaa) are usually cheaper and offer a wider choice, but more difficult to find. (Try Asakusa and the sidestreets of Ueno's Ameyoko market for local--not big chain--supermarkets.) Also, the 100 yen shop (hyaku en), have become very common, and most have a selection convenient, ready to eat, items. There are 100 yen shops near most minor train stations, and usually tucked away somewhere within two or three blocks of the big stations. In particular, look for the "99" and "Lawson 100" signs these chains are essentially small grocery stores. Also, look for bentō shops like Hokka-Hokka-Tei which sell take-out lunch boxes. They range in quality and cost, but most offer good, basic food at a reasonable price. This is what students and office workers often eat. Noodle shops, curry shops, and bakeries are often the best option for people eating on the cheap. They are everywhere. The noodle bars on every corner are great for filling up and are very cheap at ¥200-1000. You buy your meal ticket from a vending machine at the door with pictures of the dishes and hand it to the serving staff. The one question you will typically have to answer for the counterman is whether you want soba (thin brown buckwheat) or udon (thick white wheat) noodles. Some offer standing room only with a counter to place your bowl, while others have limited counter seating. During peak times, you need to be quick as others will be waiting. Fast food is available just about everywhere, including many American chains like McDonald's and KFC. But if you are visiting Japan from overseas, and wish to sample Japanese fast food, why not try MOS Burger, Freshness Burger, Lotteria, or First Kitchen? If you're looking for something more Japanese, try one of the local fast food giants, Matsuya, Yoshinoya or Ootoya. For under ¥500, you can get a giant bowl of meat, rice, and vegetables, sometimes with egg thrown in for good measure. Drinking water or hot ocha (Japanese green tea) is usually available at no extra cost. Raw fish enthusiasts are urged to try kaitenzushi (conveyor belt sushi), where the prices are very reasonable. Prices are depending on the color of the plate, so be sure to check before they start to pile up. Many of the larger train and subway stations have fast, cheap eateries. Around most stations, there will be ample choices of places to eat, including chain coffee shops (which often serve sandwiches, baked goods, and pasta dishes), yakitori places, and even Italian restaurants. Ameyayokocho (Ameyoko Market near Ueno Station) - There is a kebab joint in here, Kafkas Turkish Kebab (Store 39-B). You can get it for 500 yen (around USD4.80). Staff speak good English. Ginza - You can visit "Rasa Malaysia", a Malaysian restaurant serving South-East Asian foods. You can have Chinese Wanton Mee for 800 yen. They are halal. The address is 8th Floor, Ginza Five Star Building, Ginza 5-8-13, Chuo-ku, Tokyo, 104-0061. Tel & Fax: 03-3289-1668 Nearest subway station: Tokyo Metro Ginza station (Exit A3), 1 minute walk. Staff speak good English. Nishi Azabu - Yakiniku Restaurant. NK Aoyama Holmes 1F, 2-2-2, Nishiazabu, Minato-ku, Tokyo, 106-0031. They serve halal meat. Staff speak minimal English. By tradition the basement of almost any department store, including Mitsukoshi, Matsuzakaya, or Isetan, is devoted to the depachika (デパ地下), a huge array of small shops selling all kinds of prepared take-out food. You can assemble a delicious if slightly pricey picnic here — or, if you're feeling really cheap, just go around eating free samples! The very largest department stores are Tobu and Seibu in Ikebukuro, but Shibuya, Ginza and in fact any major Tokyo district will have their fair share. Shinjuku Station is home to several famous department stores, such as the Keio and Odakyu department stores. Many stores begin discounting their selections at about 19:00 each night. Look for signs and stickers indicating specific yen value or percentage discounts. You will often see half-price stickers which read 半値 (hanne). This discounting is also common at supermarkets located near the smaller stations, although the quality may be a notch or two down from the department stores, it's still perfectly edible. The ubiquitous izakaya, a cross between a pub and a casual restaurant, invariably serve a good range of Japanese dishes and can be good places to fill up without breaking the bank: in most, an evening of eating and drinking won't cost more than around ¥3000 per person. See Drink for details. Tokyo has the world's highest number of Michelin-starred restaurants priced to match, but one splurge is worthwhile even if you're on a limited budget: the best sushi in town, if not the world, can be found in Tsukiji, fresh from the famous fish market. Figure on ¥3000 for a set meal, which is a bargain compared to how much sushi of similar caliber would cost elsewhere, even in Tokyo. A sushi breakfast in Tsukiji, after exploring the fish market, is a great option for the jet-lagged traveler's first morning in Tokyo. Arrive on or before the first train to avoid waiting up to two hours for a place at the sushi bar. For upmarket Japanese eats, Ginza is guaranteed to burn a hole in your wallet, with Akasaka and Roppongi Hills close behind. You can limit the damage considerably by eating fixed lunch sets instead of dinner, as this is when restaurants cater to people paying their own meals instead of using the company expense account. As with everywhere else in Japan, the legal drinking/purchasing age of alcoholic beverages is 20. The party never stops in Tokyo (at least in the karaoke bars), and you will find good little bars and restaurants everywhere. The most Japanese way to spend a night out would be at Japanese-style watering holes called izakaya (居酒屋), which offer food and drink in a convivial, pub-like atmosphere (see Japan for details). Cheaper chain izakaya like Tsubohachi (つぼ八) and Shirokiya (白木屋) usually have picture menus, so ordering is simple, even if you don't know Japanese - but don't be surprised if some places have Japanese only touchscreen ordering systems. There are also some good clubs to checkout in Roppongi with regular and frequent visitors. Visiting clubs and western-style night spots can get expensive, with clubs and live houses enforcing weekend cover charges in the ¥2000-5000 bracket (usually including a drink coupon or two). For a splurge on a beverage or two, Western Shinjuku's Park Hyatt Tokyo houses the New York Bar on level 52. Providing stunning views day and night across Tokyo, it was also the setting for the movie Lost in Translation. Cocktails here start around ¥1400 - single malt whiskies are upwards of ¥2000. If you're new in town, Roppongi is home to a number of vibrant clubs and establishments which specialize in serving non-Japanese - but it's also overflowing with hostesses and 'patrons' who will occasionally hassle you to visit their gentlemen's clubs, where drinks cost ¥5000 and up. Nonetheless, the party scene thrives in Roppongi, in which case it might be a good idea to check out one of the many independently produced events such as the Tokyo Pub Crawl. As an alternative, some Japanese and foreign nationals instead prefer the clubs and bars in Shibuya, or trendy Ginza, Ebisu, or Shinjuku. Hub , a chain of British-style pubs, has branches in Shinjuku, Shibuya, and Roppongi (as well as near most major stations) and is reasonably priced, but is often used by foreigners and Japanese who want a bit of "action". Other British/Irish pubs can be found in Roppongi, Shinjuku and Shibuya. Expect to pay around ¥1000 a pint, although happy hours can reduce this by a few hundred yen. In Shibuya, the bar area behind 109 (not 109-2) and next to Dogenzaka ("Love Hotel Hill") has a large number of clubs. Unlike those in Roppongi and Shibuya's Gas Panic, these clubs have entrance fees, but clubs without entrance fees often hassle you all night to buy drinks which ends up just as expensive and without people who are actually there to enjoy the music. Shinjuku is home to Kabukicho, Japan's largest red-light district. Also in Shinjuku is the gay bar district of Shinjuku-nichome. 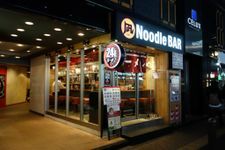 A little further from the city center are Shimokitazawa, Koenji and Nakano, full of good bars, restaurants and "live houses" offering underground/indie music popular with students and 20/30-somethings. There are thousands of hotels in the Tokyo area, ranging from cheap to very expensive. They are distributed throughout the city, with some of the high end and the low end almost everywhere. Many Western-style hotels, especially those affiliated with American hotel chains, have English-speaking staff. 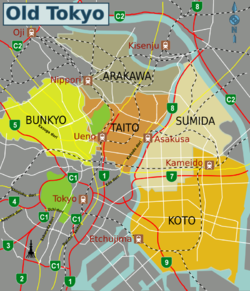 Much of Tokyo's budget accommodation can be found in the Taito area, especially Asakusa and Ueno. 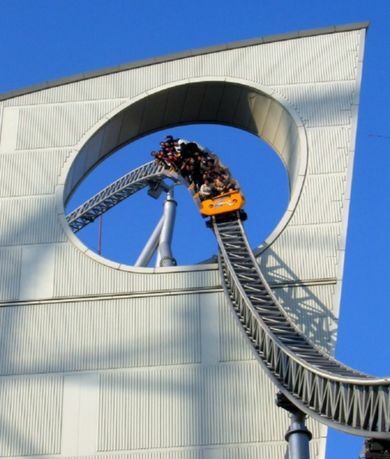 But if you are not afraid of being a little bit off-center, you may have a look to the surroundings: Yokohama, etc. Do note that most of the cheap accommodations in the Taito area (near JR Minami-senjuu) have curfew times around 22:00 to 23:00, so be sure to check that in advance if it bothers you. One hotel that does not have a curfew is Kangaroo Hotel , rooms starting at ¥3200. There's also Economy Hotel Hoteiya , rooms starting at ¥2500. You can also find a bed in a dormitory at TokyoBackpackers Hotel in Minami-Senju, from ¥2100 a night, with weekly or monthly discounts . A list of economy hotels in Tokyo is . Capsule hotels are generally the cheapest option. They may be reluctant to play host to foreigners as there are quite a few rules of behavior which may be difficult to explain; see the Japan article for the full scoop. Most capsule hotels are men-only. Asakusa Riverside  and Akihabara Capsule Inn  are among the very few to have women-only floors. 24-hour comic book library/internet cafes known as manga kisa, have become common around Tokyo. This is one of the cheapest ways to crash if you miss your last train and need to wait for the early morning transit service to get started. No bed, but you have a comfy chair and a PC and/or DVDs if you can't sleep. Later in the evening, karaoke boxes often offer discounted prices for the whole night, they usually have a couch you can sleep on. Most of these cyber cafes charge ¥1500–2500 for 8 hours. One of the cheapest ways to stay can be also a youth hostel, prices start at ¥1200, e.g. in the Shinjuku area. If you are truly on a budget, it is possible to go homeless and camp in public parks, for free. You can do this with a tent, if you want to carry one, and you can also sleep on benches, as exhausted workers and students do. It is also possible to do this all over Japan ; by doing nojuku (as the Japanese call it) and eating in convenience stores or making your own sandwiches from the food you buy in supermarkets, you can stay in Tokyo for around the same price as it would cost you in Kathmandu, Nepal! 3Q-House  in Nippori starts at ¥2,000 for a 6-bed-dorm. Walk or take bus #8 from Nippori station 3 stops to Shimo-Negishi. The bus stops in front of the guest house, the entrance is to the right of the restaurant Yakitori 燒鸟. There is a wide range of choices in hotels while at Tokyo, most of the hotels are rated 3 stars or more. Tokyo is among most of the other cities when it comes to hotels because their services and hotel locations are the best of the best. Keep an eye out for what is called a business hotel. The rooms are usually tiny, but they are conveniently located near stations and rates start from around ¥6000. Staff may speak minimal English, but it's not too hard to figure out. These are the best options for solo travelers. Affordable chains found throughout Tokyo include Tokyu Stay , which offers free internet access and breakfast, Chisun  and Sunroute . Tokyo has some self-proclaimed ryokan (Japanese inns) that cater largely to foreign tourists, mostly concentrated around Ueno and Asakusa. While not as opulent as the real thing, they offer a sample of Japanese home life at affordable rates. Japan's infamous love hotels can be a reasonable (and interesting) option in Tokyo. Shibuya's Dogenzaka ("Love Hotel Hill") offers the widest selection in the city. If you're really going to spend the night, be sure to check in for a "stay" rather than a "rest". Be warned that some love hotels (at least around Shinjuku) have a 'No Japanese, no stay' policy, presumably to avoid confusion over billing; others lock you into your room until you pay into a slot by the door to leave. If you plan to stay more than one week, you can try Weekly-Mansion Tokyo . These are flats you can rent for short periods of time for affordable prices. Rates are around ¥5000 per day for one person or a little more for two people. Sometimes you can find deals for as low as ¥4000 per day (Various promotional deals are available for online reservations). You can also make online reservations in English. You can spend a fortune on accommodation in Tokyo. Most of the high-end international chains are well represented. Particular concentrations of luxury hotels can be found in western Shinjuku (including the Park Hyatt Tokyo, featured in Lost in Translation), around Tokyo station (best here are Shangri-La Hotel, Tokyo,. Mandarin Oriental, Tokyo, Seiyo Ginza and Four Seasons Marunouchi), and in Akasaka. Beware of hotels marketing themselves as being located at "Tokyo Bay". At best, this means you'll be in or near the Odaiba district, built on reclaimed land half an hour away from the city center; at worst, you'll end up somewhere on the coast of the adjacent prefecture of Chiba, which is handy for visiting Tokyo Disneyland but quite inconvenient for touring Tokyo itself. Starbucks Coffee  Most (but not all) of the prolific Starbucks Coffee stores now offer Free Wifi service, commonly along with charging stations. Customers will need an internet connection to register for the service in advance, however. Wired Cafe (Japanese Website) A chain of trendy, technology-orientated cafes complete with full food menu and free WiFi. Usually hard to find a power outlet. FreeSpot  FreeSpot offering free wireless Internet access. Check out their maps of service areas. Tends to be somewhat unreliable nowadays. Good connections are available at Internet cafes everywhere. Expect to pay ¥400-¥500 per hour. "Gera Gera" is a popular chain. Paid WiFi service is also taking off in Tokyo with reasonable coverage - at a price. WiFi services are probably not convenient for those just visiting. Tokyo is probably one of the safest big cities you will ever visit, and Japan in general is one of the safest places to visit in the world. Most people, including single female travellers, would not encounter any problems walking along the streets alone at night. Street crime is extremely rare, even late at night, and continues to decrease. However, "little crime" does not mean "no crime", and common sense should still be applied as anywhere in the world. Often the biggest risk is travellers taking Japan's apparent lack of crime too close to heart and doing things they would never do back home. The most common crime is sexual harassment on crowded trains; when people are pressed up against each other, hands can wander. However, locals are far more likely to experience this than tourists, as the latter are considered more aggressive and more likely to stick up for themselves, especially if they are Westerners. The best way to deal with any wandering hands is to yell "chikaan" which is a widely publicized Japanese term for sexual harassment, specifically groping on trains. Small police stations, or Koban, can be found every few blocks. If you get lost or need assistance, by all means go to them; it's their job to help you! They may, however, have difficulties with English, so some knowledge of the Japanese language helps. Take the usual precautions against pickpockets in crowded areas and trains. Also be aware that theft is more likely to occur in hangouts and bars popular with travellers and non-residents. 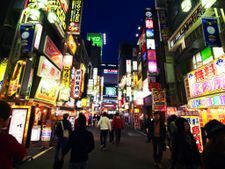 The realest and most immediate potential threat to your safety in Tokyo is likely to be found in the form of rip-off bars in red light and nightlife districts such as Kabukicho and Roppongi. While even these areas are almost never dangerous to casually walk around in, take note that large numbers of Japanese and African touts prowl the streets after dark looking for marks for their clip joint scams. If you are approached (as a tourist, most likely by an African) do not give in to promises of pretty girls or "happy endings." These men are extortionists and scam artists, charging customers exorbitant bills, often without providing the services promised. Some touts are persistent and may follow you for a few paces, though a firm "No, thank you" or simply ignoring them will usually shake them off in short order. On the open street, touts are annoying but harmless. Once inside their establishment, spiked drinks, threats of violence, beatings, seizure of personal documents and effects and more have all been reported. Just ignore them or say "no" on the street and you will be fine. Tokyo is geologically unstable. It is prone to volcanoes, earthquakes and tsunamis. On March 11, 2011, Japan was struck by its biggest earthquake ever which measured 9.0 on the richter scale, it was the 4th largest earthquake since record keeping began in 1900. Although the epicenter of the quake was 373 kms to the north, 130 kms west offshore Sendai, Japan's 6th largest city, the intensity in Tokyo was from 5 to 7 (moderate to very strong) on the merracalli scale, or 5- to 6- on shindo scale, the whole metropolitan area was completely halted. The rapid transit stopped working, people had to spend nights in train stations, offices, shops etc., fires broke out in many places, and they had long power cuts. Luckily, Tokyo was not affected by the devastating tsunami. 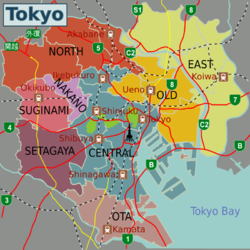 In 1923, Tokyo was struck by a Mag-8.3 earthquake, whose epicenter was just 50 kms away from the city centre. The city was completely destroyed, 143,000 people died and the whole city was put on fire. Tokyo lies near the junction of 3 fault lines and many smaller ones are directly under the city. The area is near an active subduction zone and the elevation is not too high, so it is also prone to tsunamis. To the west is Mt. Fuji, which has not erupted since 1707 but can erupt anytime. So if you are in Tokyo, always be ready for earthquakes, tsunamis, and volcanoes. Japan has the world's best earthquake and tsunami warning system, so if anything happens, it will warn you immediately. Still in a jam? Call Tokyo English Life Line , tel. , daily 09:00-23:00. If you make it as far out as the Izu Islands, note that visitors to Miyakejima Island have in the past been required to carry a gas mask, due to volcanic gases. Those in poor health are advised against travelling to the island. .... or see http://www.mofa.go.jp/about/emb_cons/protocol/index.html (Ministry of Foreign Affairs website, written in English) for an extended list of countries with embassies in Tokyo. Access to mobile online services greatly simplifies your experience in Tokyo. Mobile coverage and access to navigation systems (such as GPS) are excellent. When arriving at an airport, look for Mobile centres if you want to get a local SIM-Card. Staff there will be reasonably fluent in English. SIM Cards available at the airport tend to have better deals for tourists (i.e. plans not available to local residents). For example, it can be very difficult to find an "unlimited" data SIM card once you get into the city. Prepaid cards available to tourists have a maximum life of 30 days, most cover 10 days or thereabouts. Data volume starts at around 1GB, going up to 5GB for a 30-day-card. There are "unlimited" data options available. Most of them are unlimited as long as you don't use more than 3 / 4 GB per day. After 3 / 4 GB per day they start to throttle speed. Be aware that some phones from some areas might use different frequencies unavailable in Japan. Mobile phones are available for rent. You will need a wifi connection to register a new SIM-card (free but in heavy demand at the airports). Wifi services are widely available, but may require a registration. Phones tend to drain more quickly then elsewhere, requiring a recharge during the day, especially with satellite navigation activated. Consider bringing a powerbank. Cash is still a popular method of payment in Japan. Getting cash will be easiest at your point of arrival (e.g. the airport), as you are more likely to find English-speaking assistance. ATM's do not universally support (some or all) foreign credit cards or may be limited to ¥50,000 or thereabouts. You might have to try various machines or ask for assistance. Foreigners can be exempt from local taxes (saving you around 8 percent, prices are sometimes stated excluding taxes). Many shops or department stores offer to register your purchases for a refund (look for signs posted in English). A passport is required at the time of purchase. Fujino — a small town popular with locals and foreigners alike interested in the arts. Beautiful scenery and very refreshing after the bustle of Tokyo. This page was last edited on 9 April 2019, at 12:36.